Olympak produces the best four color process printed bags available. Quick service restaurant chains appreciate our ability to feature their new product photos and merchandising on the bags, and our retail customers love the quality. Our bags are a real winner. We are a leading designer and manufacturer of fast-food kid’s meal bags. Our graphic designers can create custom bags, featuring vivid graphics, engaging games, and clever puzzles that captivate kids’ imaginations. You can provide artwork or our in-house creative team can help bring your vision to life. Our own brand of meal bags, used in both restaurants and schools are great for grab and go meals, promotions, entertainment, and special events. These are great for kids meals, grab-and-go bags or party favors. 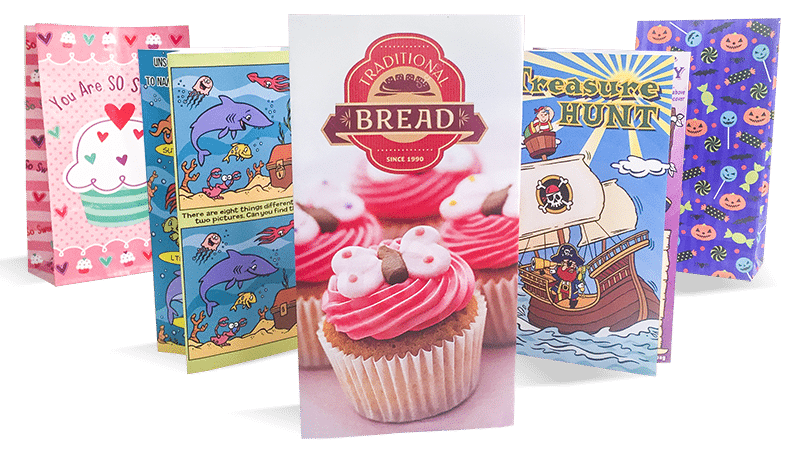 We produce beautiful high-quality gift sacks for the nation’s largest retailers Our sister company, Mello Smello, is a leader in supplying seasonal novelties to the mass market.